Where are we at in the euro zone credit cycle? In December 2016, the European Central Bank announced the continuation of its Quantitative Easing (QE) policy until December 2017. The continuing economic recovery in the euro zone and the renewal of inflation are now raising questions about the risks associated with this programme. On the one hand, isn’t the pursuit of a highly expansionary monetary policy a source of financial instability? Conversely, a premature end to unconventional measures could undermine growth as well as the ECB’s capacity to achieve its objectives. 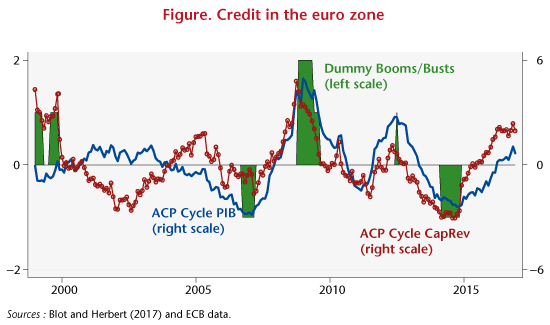 Here, we study the dilemma facing the ECB [in French] based on an analysis of credit cycles and banking activity in the euro zone. The ECB’s announcement gives us two signals about the direction of monetary policy. On the one hand, by delaying the end date of QE, the ECB is implicitly announcing that the normalization of monetary policy, in particular a hike in its key rate, will not take place before early 2018. The ECB will thus continue its expansionary policy of increasing the size of its balance sheet. On the other hand, the reduction in monthly purchases is also a sign that it is toning down its expansionary character. The announcement is similar to the “tapering” that began in January 2014 by the US Federal Reserve. Purchases of securities were cut back gradually, until they actually stopped at the end of October 2016. The undeniably expansionary nature of monetary policy in the euro zone suggests that the ECB still considers it necessary to implement a stimulus in order to achieve its ultimate monetary policy objectives. The first of these is price stability, which is defined as inflation that is lower than but close to 2% per year. There are no signs of either runaway inflation or growth  . The securities buyback programme should help to consolidate growth and push inflation towards the 2% target. At the same time, the liquidity issued by the central bank in its securities purchase programmes and the low level of interest rates (short and long term) are fuelling fears that monetary stability might have an adverse effect on financial stability. The result leaves the ECB facing a dilemma. Putting a premature end to quantitative easing could keep the euro zone in a state of low inflation and low growth. Unnecessarily prolonging QE, while the US Federal Reserve has begun normalizing its monetary policy, could create a risk of financial instability, resulting in an uncontrolled surge in asset prices, credit, and more broadly the risk taken on by the financial system. We assess this dual risk using indicators on the activity of the banking system of the euro zone as a whole and of the countries that make it up. Credit, whether granted to households or to non-financial enterprises, is central to bank assets and often at the heart of risks to financial instability. Here we propose extending the analysis to the size of the balance sheet and to total loans granted – including credit to other monetary and financial institutions – which makes it possible to measure the risk associated with the banking system as a whole. These different variables are related either to GDP, which makes it possible to capture the disconnection between banking activity and real activity, or to the capital and reserves of the banking system, which makes it possible to capture the leverage effect, i.e. the capacity of the system to absorb losses. Here we focus on quantities rather than prices, using indicators such as the ratio of credit granted on equity and the ratio of credit received on income. These are central to reflecting the transmission of monetary policy and to assessing the risk of financial instability. The graph shows the changes in the credit cycle, relative to GDP (blue line) and relative to the capital and reserves of the banking system (red line) . The green areas indicate periods when credit deviates significantly above or below its long-term trend. In general, the analysis of credit and of the size of the banking system’s balance sheet points to a recovery in activity but it does not suggest either a credit boom or an excessive contraction in the euro zone in the recent period. While credit is evolving in a relatively more favorable direction relative to its trend in France and Germany, the cycle does not indicate an excessive increase. The Netherlands and Spain are distinguished by a low level of credit relative to GDP. For the Netherlands, this trend is confirmed by the indicators relative to the banking system’s capital and reserves, while in Spain, outstanding loans relative to capital and reserves are at a historically high level, suggesting an excessive level of risk-taking given the economic situation. Translation errorDespite the recent rebound in inflation, which is largely linked to the rise in oil prices and inflation expectations, inflationary pressures are still moderate, and getting inflation back to the 2% target is not sufficiently sure to warrant a change in the direction of monetary policy. Unemployment is still high, fuelling deflation. A recent analysis by Borio and Zabai (2016) of the effectiveness of unconventional monetary policy suggests that its effectiveness could decrease even as the risks involved increase. The role of asset prices has been studied by Andrade et al. (2016), showing that asset prices had reacted, as expected, following the measures taken by the ECB, and by Blot et al. (2017) on an assessment of the risk of bubbles. See Jorda et al., 2013 and 2015. Translation errorThe Basel III legislation is based on risk indicators calculated at the level of banking establishments, while our approach is based on macroeconomic indicators. Translation errorThese cycles are obtained using a principal component analysis (PCA) of several types of trend / cycle breakdowns: the Hodrick-Prescott filter, the Christiano-Fitzgerald filter, and the moving average. ← Is the recovery on the right path?